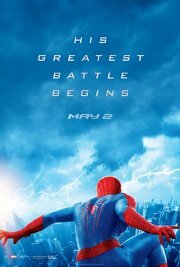 Also known as The Amazing Spider-Man: Rise of Electro, it picks up where episode one left off. Spidey is having a great time, but coming to regret that he is all that stands between good and evil in New York. With the emergence of Electro, Peter must confront a foe far more powerful than he. And as his old friend, Harry Osborn, returns, Peter comes to realize that all of his enemies have one thing in common: OsCorp. This film is releasing in 2D, 3D and 3D IMAX, this is the 2D version.